Scientific research shows that teenagers who practice yoga have a better developed prefrontal cortex which helps in planning complex cognitive behavior, personality expression, decision making, and moderating social behaviour. It also boosts their confidence, creativity, lessens mood swings and allows better circulation. Yoga also helps in building self-esteem and balance. (reference: https://www.neuropsychotherapist.com/prefrontal-cortex/). What are the main benefits of yoga for teens? Balances the hormones and improves blood circulation. Balances mood swings, energy and stress levels. Improves mindfulness, awareness and focus. Increases confidence, self esteem and acceptance. Improves creativity, discipline and attention. Pairing the teens should be done only if they are comfortable with it. Also, it should not be done in their first class. Importance of communicating with their partners should be constantly encouraged. Some essentials to not be neglected are- warm up, deeper yoga poses for couples, ending in deep stretching and finally, cooling down. The benefits of the sequence should be explained at the beginning of the practice. It is prudent to check regularly if they are comfortable continuing. Be gentle and avoid pushing them beyond their capacity. The below yoga sequence for teens covers basic beginner level yoga poses that are practiced in pairs to make the yoga class lively and interactive! 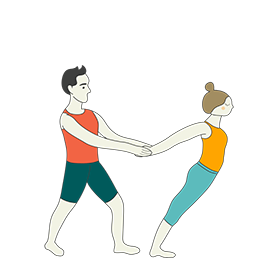 The Golden Seed Yoga Sequence has been added at the end of this sequence to help teenagers connect with themselves especially after practising the earlier yoga poses with their partners. The sequence ends with Savasana (Corpse Pose). The importance of this pose should be explained by the yoga teachers to their students and encourage them to practice it at home. View the complete yoga sequence with 13 yoga poses. Sign-up for free to Tummee.com yoga sequence builder to view, copy, and edit the sequence. Get started today for free! A. These 11 steps need to be explained with clear breathing instructions. B. The stretching at each pose along with the breathing awareness need to be emphasized. C. The reasons for warming up need to be explained. DURATION: 6 rounds of 3 pairs, leading to almost 3 minutes. BENEFITS: Helps to open the tight muscles, brings breathing in control with awareness. Improves flexibility with the deep stretches. Prepares the body for the yoga poses that demands deeper stretches with breathing awareness. A good way to introduce yoga practice to teens in pairs, encouraging them to accept, share and support their peers. A. Make them stand in pairs facing each other. Standing at less than arms distance. B. 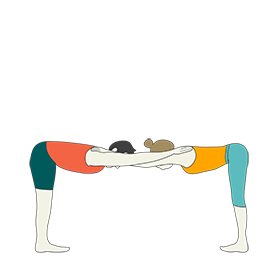 While bending the leg at the knee they stand in Double Dancer Pose, and hold each other while touching at the palms. C. Standing and holding the toes of the bend leg, explain to them about the stretch at the quads and the knees. D. Ensure the backs are straight and in alignment with the shoulders. DURATION: Done for 3 breaths with each leg. BENEFIT : Double Dancer Pose is a simple standing yoga pose practiced to build balance. A. Releasing from Double Dance Pose they stand in Tadasana to rest. B. Interlocking the hands at the wrists with their partner. C. Exhaling to bend down like Chair Pose or like Elevator Pose. D. Back straight and thighs parallel to the floor, if possible. Knee just above the ankles. E. Stretching their arms out remaining here to feel the hips, knees, ankles and calves stretch. DURATION: 2 rounds of 6 breaths each. BENEFIT: Strength at the hips and knees with balance. A. Releasing from Elevator Pose and continue standing in front of each other in Tadasana. B. Exhaling and interlocking the arms at the shoulders with the partner, while placing the hands on the partner's shoulder. C. Exhaling to bend the torso flexing at the hips while adjusting the body to stand comfortably. D. Lean On Me Pose, the torso should be parallel to the floor. Emphasize on not pushing the partner, but to just take support. BENEFIT: Stretching the spine and hamstrings. A. Release from Lean On Me Pose and make them stand besides each other in Tadasana. B. Inhaling, they bend the outer leg at the knee to stand in Vrksasana. While here, both the arms are stretched while the inner arm palm is touching the partners palms. C. If the palms don't reach, they can hold each other at the hips. D. Allowing them to connect with the breathing the stretches at the arms, shoulders, abdomen and legs. DURATION: 6 breaths with each leg/side. A. Releasing from the practice of Dvi Vrksasana, they come to stand in Tadasana, away from each other at arms distance. B. One of them turns around and as they exhale they stretch the right foot in front, while facing their partners bending at the knees. They stand in Warrior Pose bending their front leg at the knee. C. Exhaling they interlock their hands, using their opposite hands. One arm stretches front holding the partners opposite hand stretched from behind. D. Focus here is the coordination of the movement of the body with the partner's body movements. The feet are placed besides each other in order to get the alignment right in Warrior Friends Pose. DURATION: Remain for 6 breaths on each side. A. Releasing from the practice of Warrior Friends Pose, they stand in Tadasana to relax and focus on breathing. B .Giving them a moment to look back at the yoga poses they did as a pair and couple, you could bring in Q&A sessions with the teens to find out their views. C. Once convinced about their views to continue, the yoga practice can be made deeper focusing on coordination and trust. D. Here, the partners stand one behind the other. 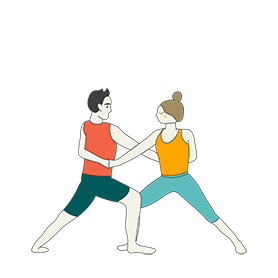 The partner behind holds on to the arms of the partner in front, and as the partner in front exhales he /she goes forward stretching the entire body in a inclined way, while the partner behind holds and pulls the partners arms giving support for the partner in front to go deeper into the pose- Open Heart Pose. E. This pose is all about trust and surrender. The deep stretch at the hamstrings and the calves while stretching the shoulders and lower back is to be emphasized. The partner behind holding, should also feel the stretch around the shoulders and the back. F. A great pose to encourage trust and surrender. DURATION: 6 breaths in each round to be done twice. BENEFITS: Deep stretch around the back, chest, arms, hamstrings, calves and abdomen. Builds coordination with focus. A. As the trust and surrender increases amongst the partners, the yoga practice should also get deeper. B. Releasing from Open Heart Pose, the partners now stand back to back in Tadasana and take a few breaths. C. Inhaling, they interlock their arms at the elbows, while placing their shoulders and back close to each other. D. Exhaling they bend their knees and flex their hips to go into Chair Pose, and here it is Back to Back Chair Pose. Ensure they are going down at the same time while exhaling. E. A great pose that talks about trust and surrender. 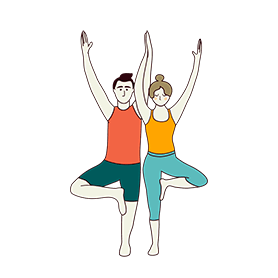 While in this pose, a variation of Chair Pose, give them the time and space to adjust as partners to enjoy the pose and let them get the maximum from the pose at their own pace. DURATION: 4 breaths in each round leading up to 2 rounds. BENEFITS: A great pose that encourages body and breathing awareness. While the stretch at the hips, lower back, thighs and knees are also to be felt. Builds endurance while surrendering to the partner. View all 13 yoga poses with cues. Sign-up for free to Tummee.com yoga sequence builder to view, copy, and edit the sequence. Get started today for free!